Our 2.2 kW Plug and Play Spindle / VFD System is a production-level cutting solution that offers a significant capability upgrade over a standard router by providing a consistent 3 HP of cutting power across a wide RPM range, allowing for faster and deeper cuts. It is preconfigured to run with any of our CNC Electronics Systems and Kits, or can be integrated into most other CNC electronics configurations. Plug and Play operation with our current CNC Electronics Systems and Kits (retrofit options available for previous configurations). More power. Unlike routers, which advertise only peak power ratings that are never actually achieved under real-use, our 2.2 KW Spindle offers 3 HP of actual cutting power throughout the RPM range (8000 - 24000 RPM) regardless of workload, allowing for much faster operation and greater cutting pass depth. Longer lasting than a router, designed for continuous use in production environments. Operates at quieter volumes than most typical routers. High-quality air-cooled spindle offers simple, reliable and durable operation including internal thermal protection (does not require a liquid cooling solution). ER20 Collet system accepts up to 1/2" shank tooling. Requires only standard/residential single-phase 220V AC power (approx. 9.7 amp draw, standard 30 amp circuit recommended). Industrial high-flex cable with locking M23 connection between VFD enclosure and spindle. Control cable with 14-pin locking connection between VFD enclosure and CNC control electronics. Our current CRP800 Plug and Play Electronics Systems (Plug and Play NEMA 23 CNC Control System and Plug and Play NEMA 34 CNC Control System) are "Spindle Ready" and require no additional components to work with this Spindle / VFD system. 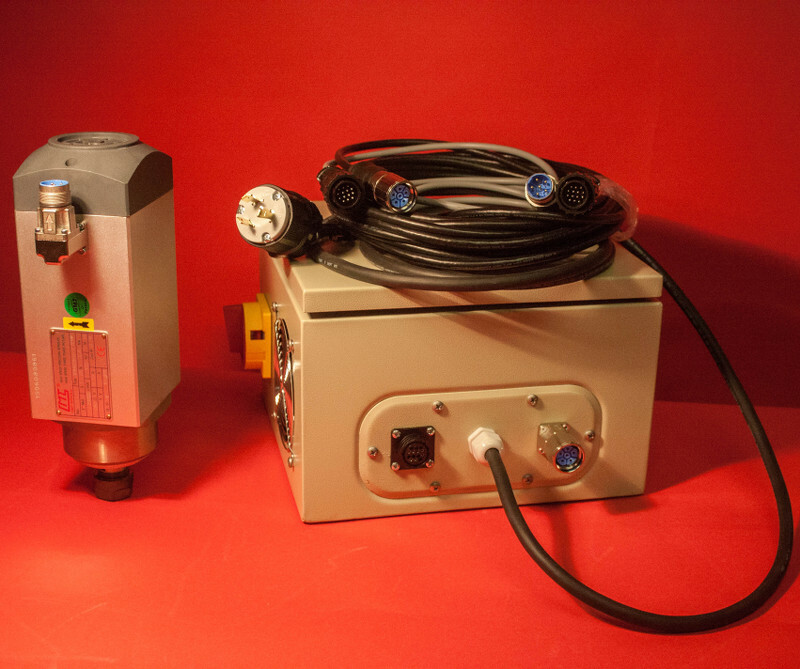 CRP500 / MX4660 - this option includes an additional Ethernet cable and gland connector for integrating with either our previous NEMA 23 Plug and Play Systems (systems with CRP5042 digital drivers that were built prior to February 2015), or with the Leadshine MX4660 4-Axis Stepper Driver. CRP300 - this option includes an additional PMDX-107 Isolated Speed Control card, Ethernet cable, and gland connector for integrating with our previous NEMA 34 Plug and Play Systems (systems with Gecko G201X or G203V drivers, and PMDX-126 breakout board). This product was added to our catalog on September 28, 2015.